Low back pain is an extremely common medical problem. It has been estimated that between 75-85% of Americans will suffer from back pain at some point in his or her life. Back pain is also a very common reason to see a physician, ranking the third most common reason by a recent Mayo Clinic study. Low back pain comes in many different varieties. Sometimes it presents as an acute, sharp pain that goes away in days to weeks that may be due to a strain or sprain. Sometimes low back pain presents as a persistent, achy pain of weeks, months or years duration that may or may not travel down one’s leg due to a possible joint, disc or nerve disorder. Also, electric like leg pain without back pain can be caused by a pinched nerve in one’s back that many refer to as “sciatica.” Generally, most chronic low back pain can be attributed to deterioration of the intervertebral discs; shock absorbing structures located between the weight-bearing bones in one’s spines that allow for the low back’s significant range of motion. Unfortunately, there is no cure for low back pain. 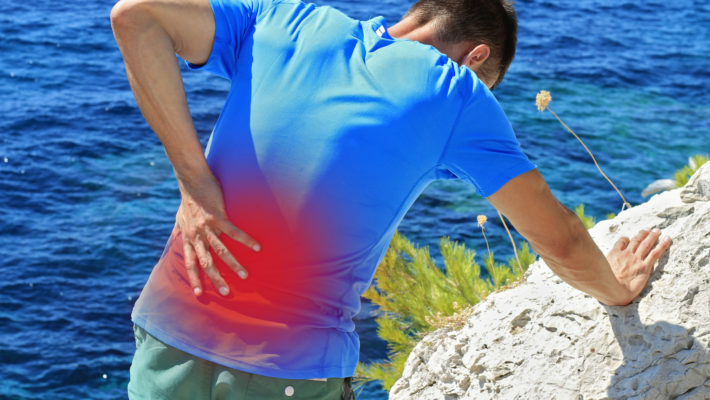 The natural course of some low back pain, such as a sprain or strain, is resolution over time. Other low back pain persists intermittently or constantly and can become a chronic problem. Regardless of the cause or the time course, there are treatments that can be utilized to manage low back pain and allow sufferers to function optimally and perform his or her activities of daily living without pain or with decreased pain. Managing low back pain almost always starts with non-operative care. The initial focus is usually improving one’s core strength through exercise. Heat, medications, manipulation and injections can be tried as adjuncts to this treatment. Occasionally a brace is needed depending on the cause of the pain. In certain circumstances, surgery can be indicated for treatment of one’s low back pain however, fortunately, this is not extremely common. There are red flags accompanying low back pain that raise suspicion for a serious cause. A few of these symptoms include new or considerable low back pain in someone who is less than 18 or more than 55 years old, significant trauma, constant pain not affected by movement, a history of cancer, unintentional weight loss, severe restriction of motion, bladder or bowel issues, numbness in the groin and progressive weakness in the extremities. If you have symptoms of low back pain it is recommended you schedule an appointment with your primary care provider for evaluation and referral to a specialist if needed.